Deck like new in box with book and deck bag; deck never used. Box has slight shelf wear. Most Tarot decks with really spectacular designs are really just art collections. The Gilded Tarot transcends this limitation by having some of the most strikingly beautiful art on any Tarot deck, yet follows the Rider-Waite-Smith model. The result is a unique deck that any person with some Tarot experience will find instantly familiar and usable. This deck can be used with any Tarot system or book. You really must see the cards to believe their beauty. The High Priestess dances on water in a translucent dress of stars. She bends backwards in front of a crescent moon, looking like a classic lamp from the 1920s. The Wheel of Fortune shows the zodiacal wheel around a solar center as part of a bizarre, almost alien machine. The Hanging Man follows this machine concept, but he is dressed in brilliant reds and greens. The colors are deep and intense, almost metallic. They draw you in and will have you staring at the images repeatedly. But this is more than a deck to look at, it's a deck to use! 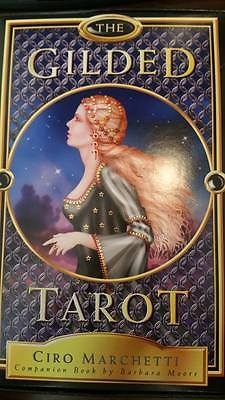 The Gilded Tarot Companion, a full book by Tarot expert Barbara Moore, is included with this deck. It's a complete introduction so that even a beginner can use this deck right away. If you're tired of the old style of the RWS deck and its imitators, if you're looking for a familiar deck that will take you into the future, this is the deck you want to use.